Roll straight from your weekday training into your weekend race on one set of wheels with the Rolf Prima Vigors. This alloy clincher wheelset has 32 mm deep Delta-profile rims that give it class-leading aerodynamics and crosswind stability, and Sapim bladed spokes together with Rolf's TdF4.4 hubs ensure not a single watt is wasted. Includes quick release skewers and rim strips. Upgraded my Rolf Prima Echelons to the Rolf Prima Vigor wheel set after 8,000 miles on the Echelons. The rear hub wore out. Replaced them with the Rolf Prima Vigor wheel set at a whooping 35% off, thanks to a great Western Bikeworks sale! The Vigors are even more aero, smooth, and provide better power transfer with regard to the ride. I'm cruising at 1-2 miles an hour faster with the same effort. Hoping to get 10, 000 miles from this set as the Tdf4.4 rear hub is a definite upgrade. When these wheels wear out, I'll be returning to Western and a Rolf wheel set for sure. 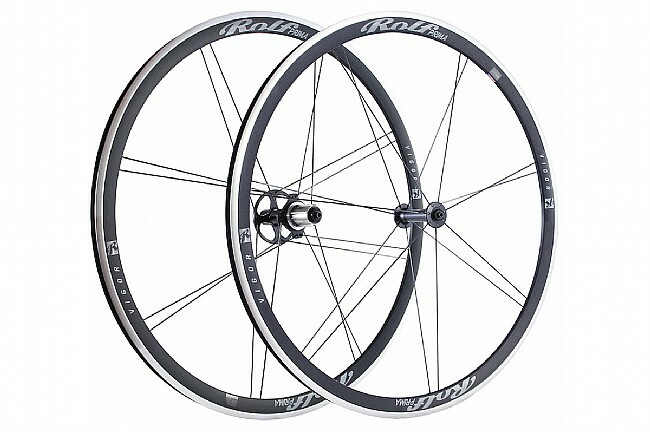 PS the minimal number of bladed spokes on Rolf's wheels make a cool stand out statement sleek, fast, cutting edge.